In the beginning, our human female used to feed us with a cereals mix also. But, at some point, she discovered some French website and forum about our kind and she stopped. 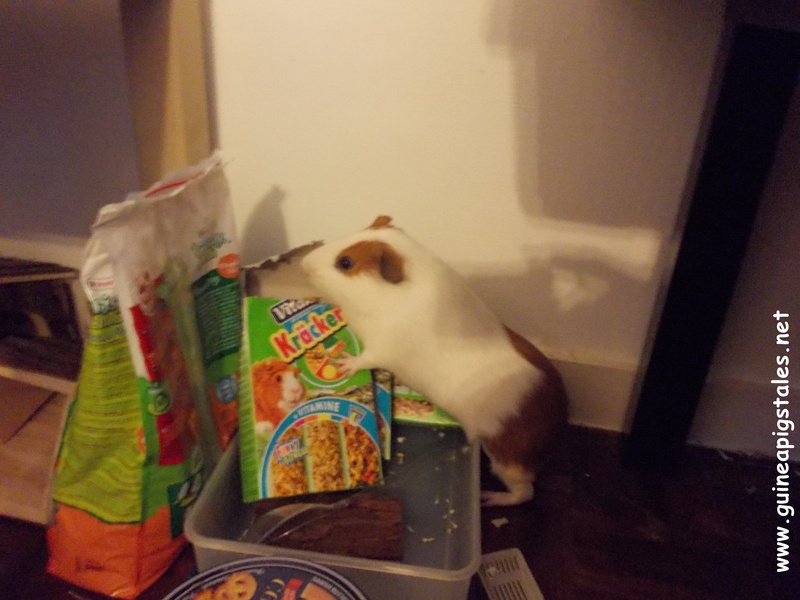 Although she claims is because I was going over 1.300 kilos, I am pretty sure is because of all those French ideas about “good food”… I wonder if any Guinea Pig supervised the making of that site! So, she red and red, she asked if my weight is normal, and after few days of debate she decided we will no longer receive cereals. This was actually a shock, as I always thought that I’m the boss in this house. Yeah, OK, I share my crown with Spock, but he is too busy running around so I’m the one giving orders. When we realized is no joke, we really started to worry: what if she will start growing some weird vegetables and feed us only that?! How crazy can she go? I even tried to play “the puppy eyes” with the human male because usually he feeds me over the line. I think he likes how I still the extruded mix from between his lips… But these time nothing! She must have trained him very well. I rolled my beautiful perfect shaped eyes hopping he will fall, but he was too afraid of what may happen if she sees I gained 1 gram. But one day, being left in the living room, I realized where the goodies were. Oh, I forgot to tell you that right before the human female panicked I was getting obese she ordered a large stock of grain bars. 😀 So, they were somewhere in the house, waiting to be served from time to time at special occasions. I was just inspecting the grounds to see what Spock did while he was alone in there and when I got in to our storage room (which is actually an open space beneath our rooms), I saw the familiar boxes. I told myself “Oh, my! What a discovery!” and I wondered if there were only the empty packs or also some good stuff inside. I thought of destroying it (the proof, not the human! ), but I look so pretty and it will be a loss for my future biography. Don’t you think so? !